It’s baaaaack! The 2nd Annual Send a Kid to Camp AXE-Travaganza Fundraiser has returned! 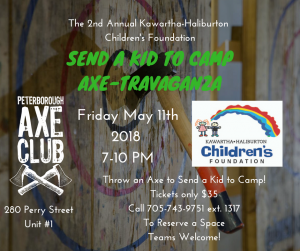 Come learn the fine art of “chucking steel” with the wonderful staff at the Peterborough Axe Club and help us raise money for a wonderful cause! Going to camp is one of the most enriching experiences a child can experience. From making friends, to learning independence, to being able to grow and discover the world in their own unique way, camp can be one of the best experiences in a child’s life. By supporting this event, you can allow us to send children receiving services through the Kawartha Haliburton Children’s Aid Society to Summer camp.